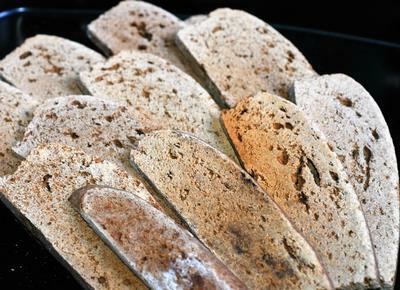 Biscotti fresh from the SUN! For this bread we used a regular cardboard/foil oven and reflectors of the type of María Telkes to get the loaf baked and then a Copehaguen solar oven to toast the Biscotti slices. We mix the yeast with the 1 spoon of sugar and warm water and let it react. In the meanwhile we start mixing all the rest of the ingredients in a big bowl and knead until easy to handle. We let it rest for 1 hour. We then form a loaf with the dough and place in a metal tray. Place it in the sun for 2 to 3 hours of clear lovely sun and then let it cool. Cut into slices and place in metal trays covered with cheese gauze to allow the sun and air but repel any insects. As they become dry and toasted remove from the sun and prepare a fantastic coffee to accompany the cookies. Maybe you would like to hear Italian music to go with the ambiance. Thank you again for another great solar cooking recipe. You surely are a prolific solar cook. It seems you take advantage of every opportunity to use the sun to your cooking advantage.